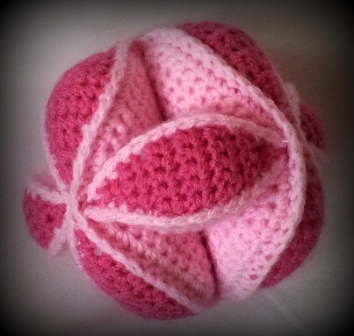 Let me introduce you to my Crochet Amish Puzzle Ball. I can hype it up and tell you that your kids will have endless hours of fun playing with this puzzle ball, but the truth is that I have a lot more fun with this puzzle ball than my kids do (although they love it). The minute someone walks into my house I practically force it on them! And what fun it is watching people try to assemble it. Of course it only takes them a little while to figure it out, because it IS pretty simple. But doesn’t it look cute? 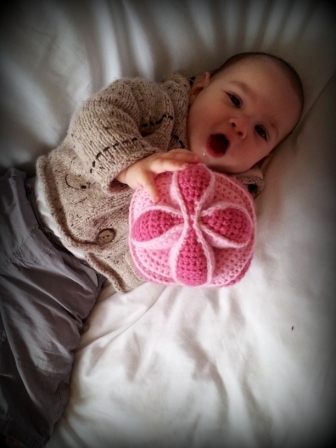 The chunky design means that it is super easy for little hands to grab hold of. And the million colour possibilities make it a treat for little eyes and inquisitive minds. Now, before we go any further… If you are at all concerned about the apparent amount of sewing involved, let me put your mind at ease. 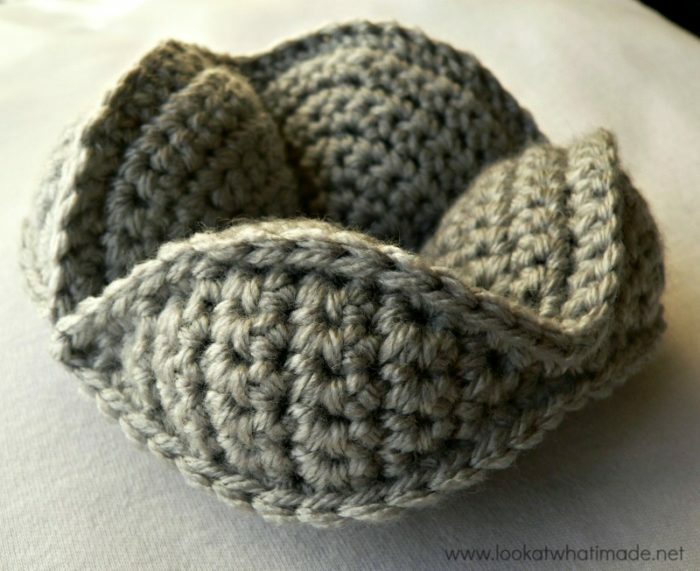 All the segments are crocheted together at the end and the tails of yarn are enclosed INSIDE the ball (if you follow my advice), leaving you with 3 tiny tails of yarn to sew away. That’s right! Three itty bitty bouts of sewing. I think that’s pretty awesome! How does the Crochet Amish Puzzle Ball work? The ball comes apart into three separate rings/segments (each containing four wedges) which then have to be re-assembled to form the ball. Be warned that this is one of those mind-numbing projects. You will need to make 12 of the same thing. So I would advise resigning this particular project to evening tv time (if you indulge) and car trips. Thank you, Tannie Esther, for sending me the link to the fabric Amish puzzle ball and starting me on this journey! Dedri Uys ©2011. All Rights Reserved. Translations are available in Spanish, Swedish, Danish, Dutch, Italian, German, Polish, and Russian. The links can be found below the pattern. If you prefer to use double knit yarn and a 4 mm hook, the ball will be roughly 13 cm (5″) in diameter. If you use worsted weight yarn and a 4 mm hook, the ball will be about 15 cm (6″) in diameter. Update: I have recently started working with worsted weight yarn and much prefer the denser structure obtained when using worsted weight yarn. 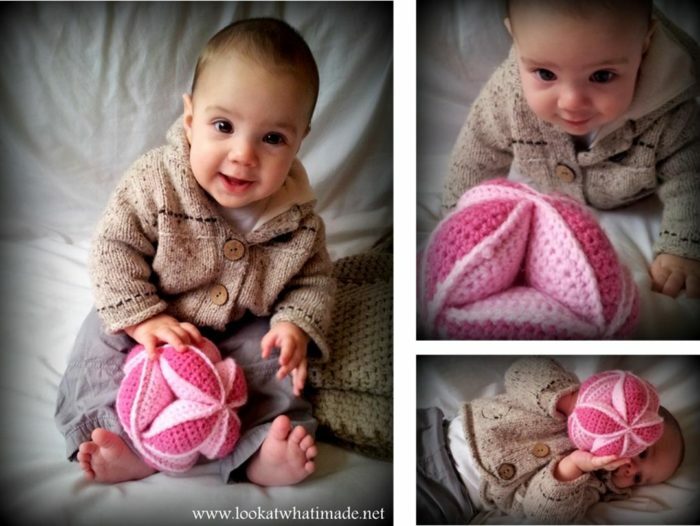 The ball below is made with the materials listed below, but I suggest you use worsted weight yarn instead of double knit! If you do use worsted weight, you will need about 220 meters. Double knit yarn (light worsted weight/#3) in contrasting colours – about 120 m for the wedges, 45 m for the lids and 30 m for crocheting the lids to the wedges. US Terminology used. You can find a US/UK comparison chart HERE. () – Repeat all instructions between parentheses the number of times specified. The initial ch st in each row/round does not count as a st. These wedges are worked in rows and joined with a seam. If you would rather make seamless (spiral) wedges, see the instructions for the Star Ball. Fold the half-circle in half so that the end containing the hook is closest to you (Photo 2). Insert your hook into the first row down the side of the resulting wedge (through both layers – see Photo 3) and make a sc (through both layers) Make 8 more sc, working into each row down the side and through both layers. Remember to put your initial tail of yarn INSIDE the wedge before closing it completely. When you get to the end, ch 1 and fasten off (Photo 4). 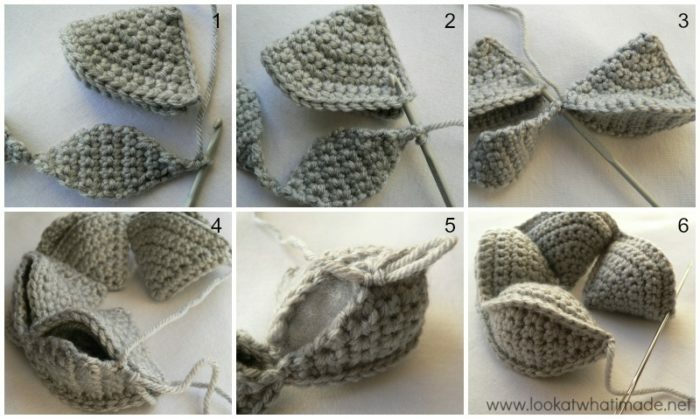 To eliminate the final tail of yarn, insert your hook into one of the stitches at the pointy end of the wedge (from the inside of the wedge to the outside – see Photo 5) and pull the final tail of yarn through to the inside of the wedge (Photo 6). If you want to, you can turn the resulting wedge inside-out so that you don’t end up with a seam. I personally prefer (and recommend) the seam as it helps the Puzzle Ball to interlock better when assembled. 14. Sc2tog. Do not bind off. Repeat rows 1 – 14 THREE more times. This will give you a chain of 4 “lids”. On the very last “lid” of the chain, ch 1 and fasten off. Hint: If you are going to use the “lid” colour (so the same colour) to attach the wedges to the lids, don’t fasten off. Just continue with the assembly instructions below. It just saves having to work away another tail of yarn. Use the yarn you used for the wedges, or a third (different) colour. If you are using a new colour, start with a slip knot already on your hook. You will be attaching 4 wedges to each chain of lids, working up the chain of lids on one side and then down the other side, stuffing as you go. You will be working into each st of the wedge opening and each row of the chain of lids. 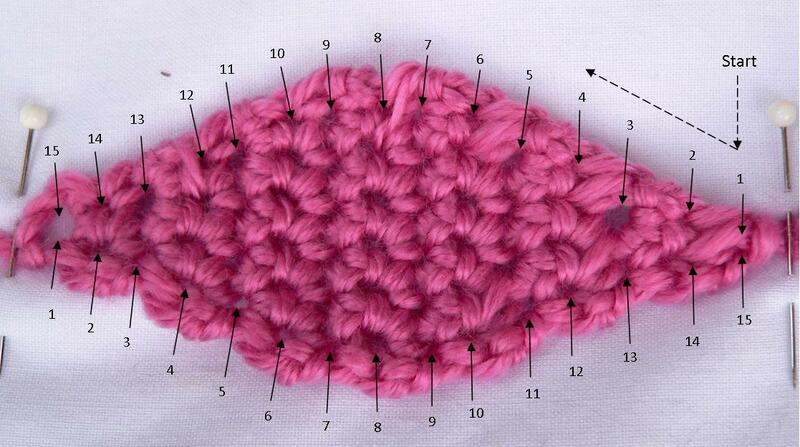 See the section below if you are unsure about the placement of the stitches in the rows of the lids. 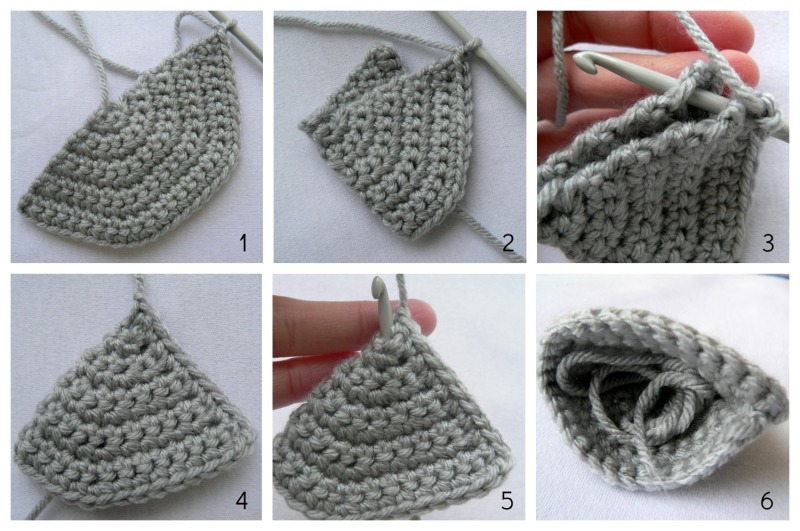 So, place your first wedge behind the first lid on the right (with the sc seam of the wedge to your right – see Photo 1) and insert your crochet hook through the first st of the chain of “lids” and the first st of the opening of one of the wedges (Photo 2). If you have turned your wedge inside out, or you have worked it in a spiral, start on any st around the top of the wedge. Make a sc through both layers. Make 14 more scs, working into each row of the lid and each stitch of the wedge (so both layers). Join the next wedge to its lid in the same way (Photo 3) and continue until you have attached one side of each of the 4 wedges and lids. Now you will be “closing” the wedges. Insert your hook into the same (last) st of the fourth lid and the next st of the fourth wedge, and make a sc. Continue working through both layers as before, making 15 sc along the other side of each wedge and lid (Photo 5), and stuffing as you go (see A Word About Stuffing below). When you reach the last st of the first wedge, join to the first st with a sl st and fasten off. Use the tail to join the tips of the first and last wedges together (Photo 6). Alternatively you can sl st them together before binding off, which is what I prefer. To do that, simply sl st in sts 16 and 15 of the sts around the top of the 4th wedge (in that order), so the stitches at the pointy end, and then sl st in the first and second sts of the first wedge. Fasten off and work away your tails. You have now completed one segment. Repeat for the remaining 2 segments. Having trouble lining up the lids and the wedges? Although the lids only have 14 rows, there are 15 “holes” along the side of the lid. This is because the chain st you work the sc inc into in the first row also forms a hole. So, in essence, you are working into that ch st and then into each of the 14 rows. I have included a numbered photo below to help explain this. It is numbered starting from the sc2tog of row 14 ( on the right), where you will start attaching the lid to its wedge, through to the initial ch st of row 1 (on the left), and then back again around the bottom of the lid. I hope this eliminates a few questions. This ball EATS stuffing! And I have noticed that people tend to think they have overstuffed the ball because the wedges are quite fat and the segments super snug… But the ball will stretch over time and to get the best results you want to stuff it nice and full! If you use too little stuffing, the segments won’t sit together as well and the ball is more likely to become lifeless after a lot of playing. Just don’t stuff it so much that it becomes “holey”. You might find this Stuffing Bomb Tutorial useful. When your segments are all nicely stuffed and neatly finished off, use them to build your puzzle ball! Now, because this is a puzzle, I am not going to explain how you assemble the ball. But I have included a photo of how the first 2 segments should interlock and a photo of what the ball should look like once assembled. This video tutorial should answer any questions you may have. Please note that Elizzza turns her wedges inside out before attaching them to the lids. I prefer not to turn them inside out. Keeping the seam on the outside makes it easier to attach the wedges to the lids AND it helps the wedges interlock slightly better when the ball is assembled. Dutch Translation by the ‘Haak Met Ons Mee’ Facebook Group. Q: Can you work the wedges in a spiral instead of in rows and thus avoid the seam? A: Yes, you can. But again, the seam helps the wedges interlock slightly better when the ball is assembled. You can find a pattern for seamless wedges HERE. Q: How much should I stuff the wedges/ball? A: You need to stuff it enough so that the wedges bulge slightly, but not so much that the stitches stretch and become “holey”. It doesn’t matter if your 3 segments seem quite snug. In fact, you want them to be quite snug. After a while the segments will relax and if you haven’t stuffed your ball enough, it will become limp and lifeless. Q: Help! My lids are too small for my wedges! All yarns are NOT created equal. So if you are going to use scrap yarn for your ball, or even if you use 2 different types of yarn, there is going to be a variation in your gauge. When using different types of yarn (even if they appear to be the same thickness), make sure that the yarn you use for your lids is as thick (or thicker – within reason) than the yarn you use for the wedges. The wedges are more forgiving than the lids. If you have any other questions, please feel free to contact me and I will try my best to answer them to your satisfaction. Love it! I had so much fun choosing colors – I went with light blue lids, and alternating white and light gray centers. I also found that doing a sc border in my attachment color before joining lids to wedges made it much easier and made the outline clearer! Can’t wait to work up lots of different colors for my nephew. This was amazing. I had so much fun making it. This is a gift for a friend of mine, and I hope that she enjoys. Thank you so much for this amazing pattern. Just finished my first one and it looks super. You’re right – the adults are having as much fun as the kids. I slightly changed something on the lids. When doing the ch2 to start #2, 3, & 4, I went in to the second chain but also picked up a loop from the last sc2tog, like when closing a picot. I found it provided a sturdier connection. Hi Laura. Did doing it this way still leave you with 15 ‘holes’ to work into when joining the lids to the wedges? Would it be alright if I made some to sell at my childrens school Christmas fair. Of course all attributes to you will be mentioned, along with your link to your patterns. 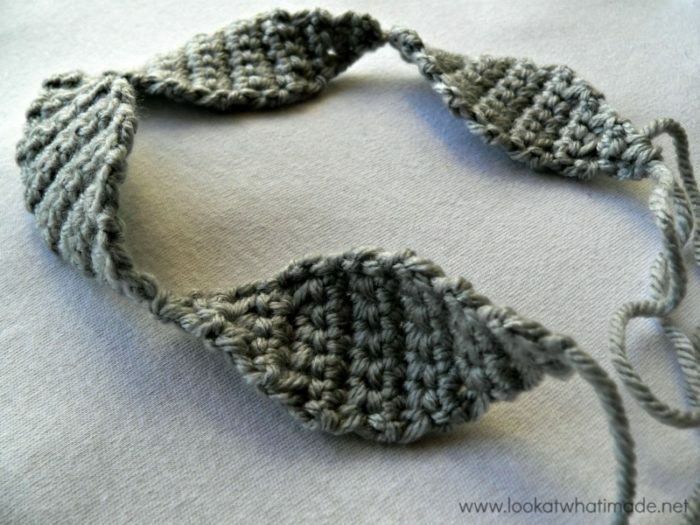 I really loved this pattern and it was easy to follow! 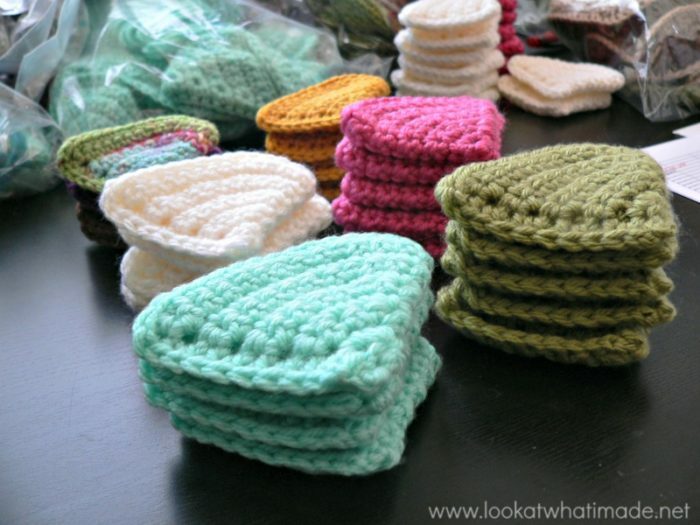 Great project for scrap yarn! Hi, may I ask if I can use a 4.5mm Crochet Hook instead? Thanks! Yes you can, but your tension won’t be as tight if you use a 4.5 mm hook with double knit yarn. I would use a 4.5 with worsted weight/aran. I haven’t made this pattern but plan to start it today. Thank you for this pattern. Thank you for this tuto. I ‘ll try it for the baby of a friend of mine. i’ll tell you later when it’s done ! Merci merci merci pour ce partage !! I am most anxious to attempt your design. I have question of yarn though. I would like to use a 100% cotton like Lilly & Cream or similar. What do you think of the option? Other yarns may fuse if close to mouth is my thought. Hi Joanne. Cotton makes a wonderful sturdy puzzle ball, but due to its lack of elasticity, the ball will require elbow grease to build. You can see the results at my blog. After finishing the first lid and when beginning the second one do you chain 1 and turn to start lid 2 or just continue with the second lid? Each lid starts with a chain 2. Thank you Dedri. That helped. My problem is attaching the lids. When I start attaching the lid to the second wedge should the chain 2 be attached to the first wedge or the next one? Hi Alice. Each lid starts with a ch-2 where you then work into the second chain from the hook to make your next row. The second chain (that you worked into) will form the first ‘hole’ that needs to be worked into when attaching each wedge. So when you have attached your first wedge, the first stitch of the second wedge should fall in this ‘hole’ of the second lid and in the first st of the next wedge. I hope that makes sense. If it doesn’t, please use the contact me tab at the top of this page to send me an email and we can take it from there. I love the puzzle ball, and far from being mind-numbing, it is addictive! Thank you. Hi. 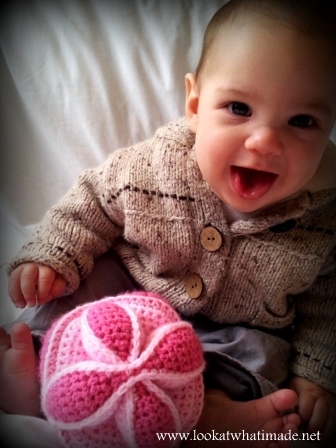 You can find the free pattern for the octopus here. I’m working on this now but I have a question. When doing the lids, what does “sc2tog” mean? I’m unsure of the terminology. Thank you so much! Nevermind! I figured it out. Thanks! Sc2tog is single crochet 2 together or single crochet decrease. Hi! I am making this now and there is a small gap when I count 9 SC closing my wedge. Should it be 10 SC? There are 10 hopes up each side. 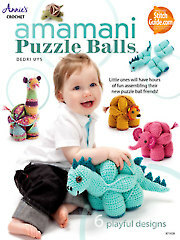 Thanks :) This is a brilliant pattern- one of the most creative toy patterns I have ever seen! I made one for my nephew (albeit it isn’t as perfect as yours, however I hope he’ll enjoy it nonetheless) as a playful alternative to chocolate Easter eggs. I’m having trouble making the lids. I keep getting gaps on the sides of the lids when increasing. I’ve always done more rounded amigurumi type things before, so this diamond shape has me stumped. What might I be doing wrong when increasing? I’m really excited to make tons of these for all my friends’ kids! Hi Denise. I am sending you an email. You can reply to that with a photo and I will see if I can help you? How fun, Sandie. I wish my bus driver was half as nice as you are! Once you have made the basic ball, the elephant isn’t hard.